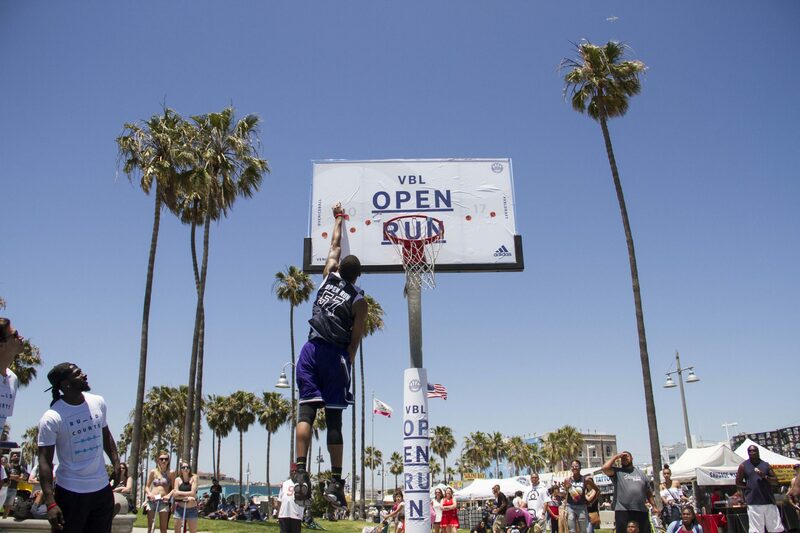 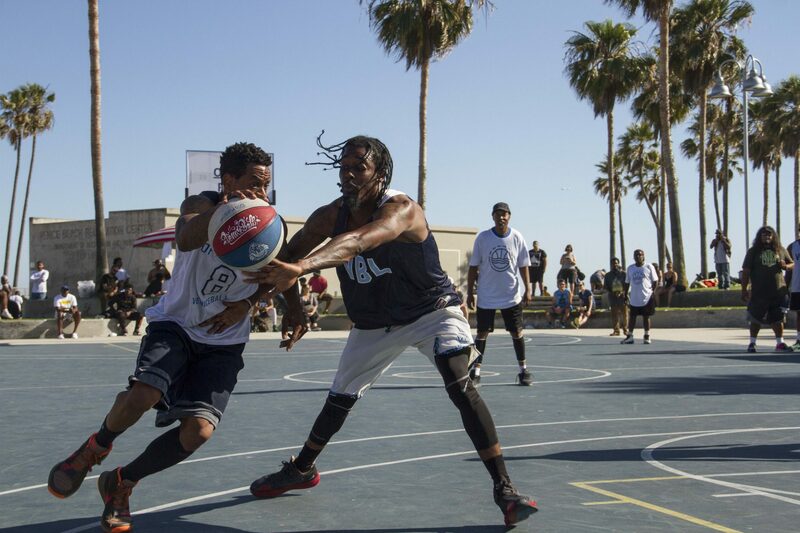 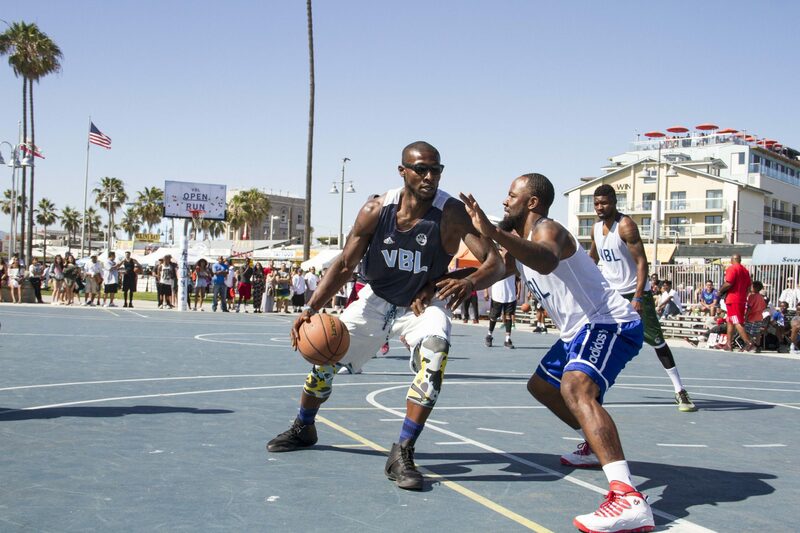 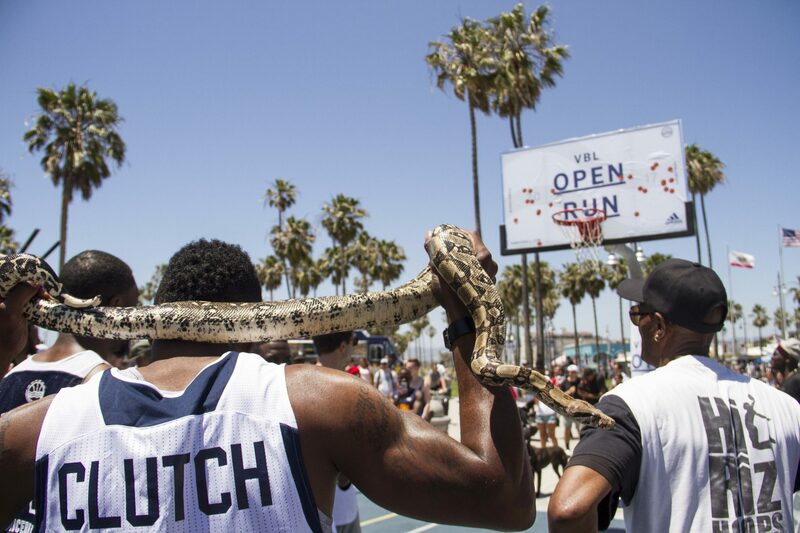 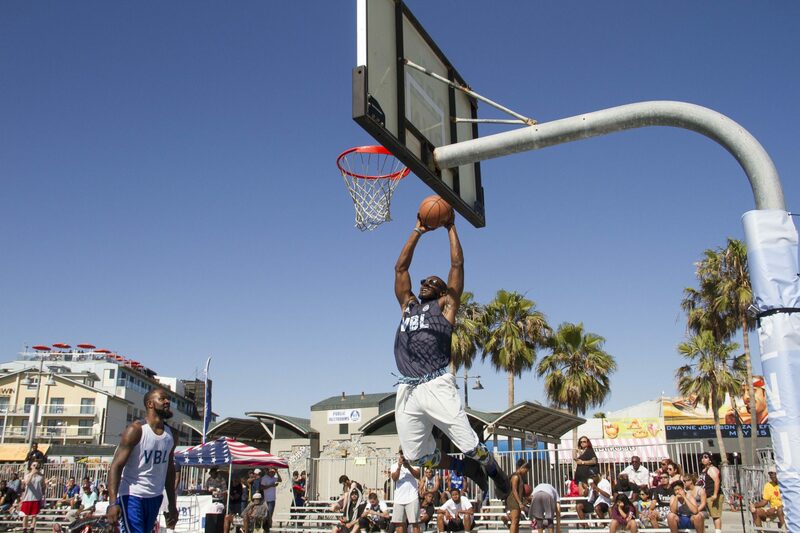 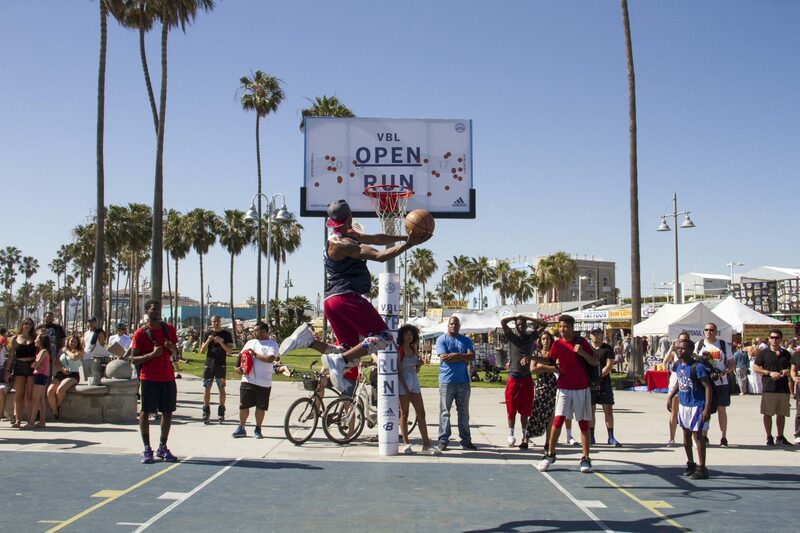 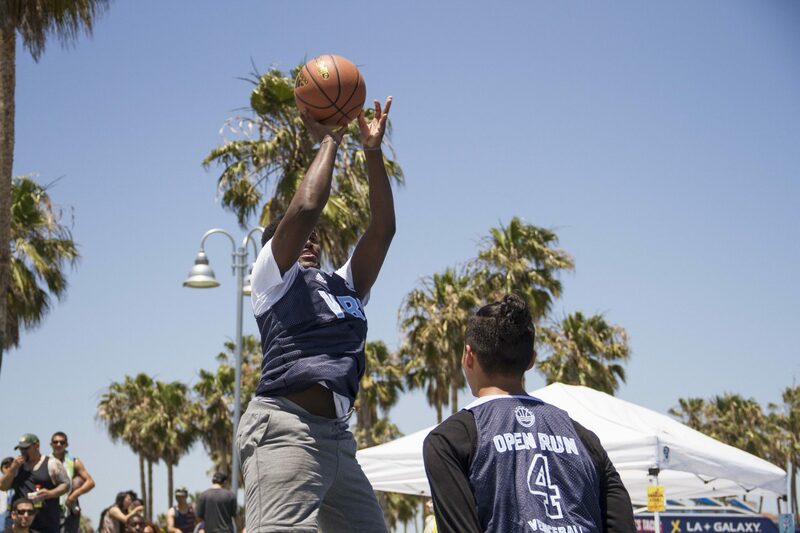 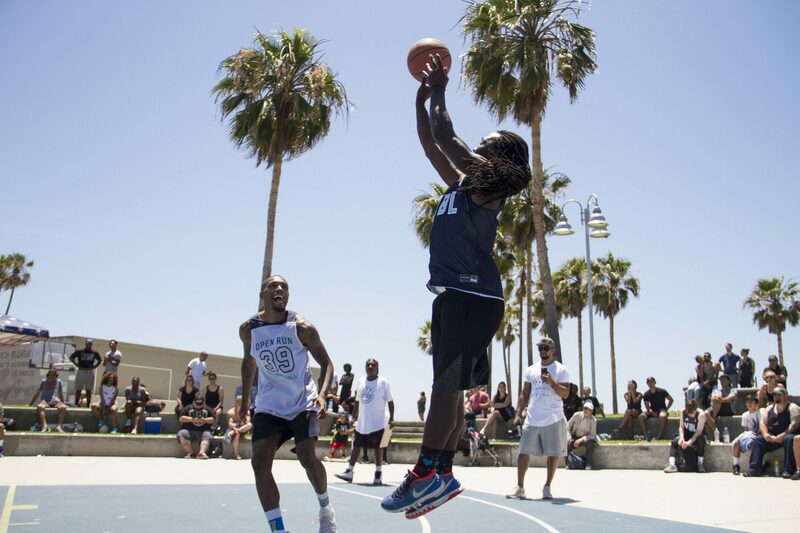 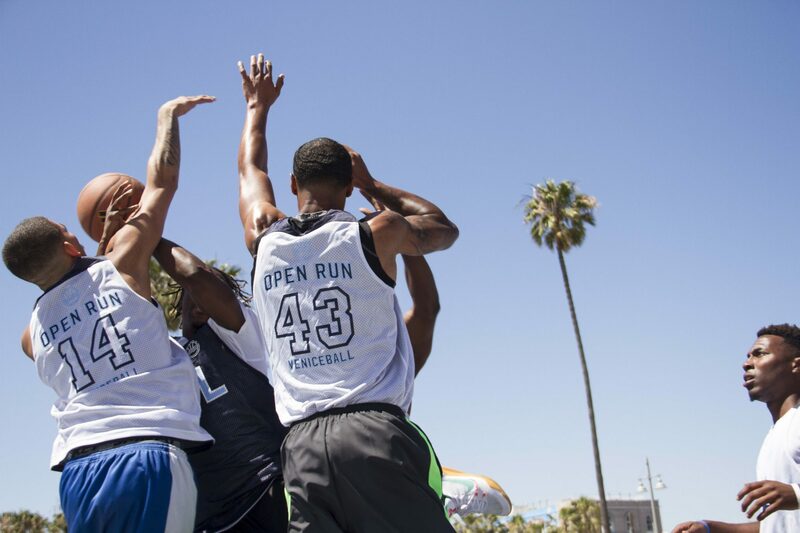 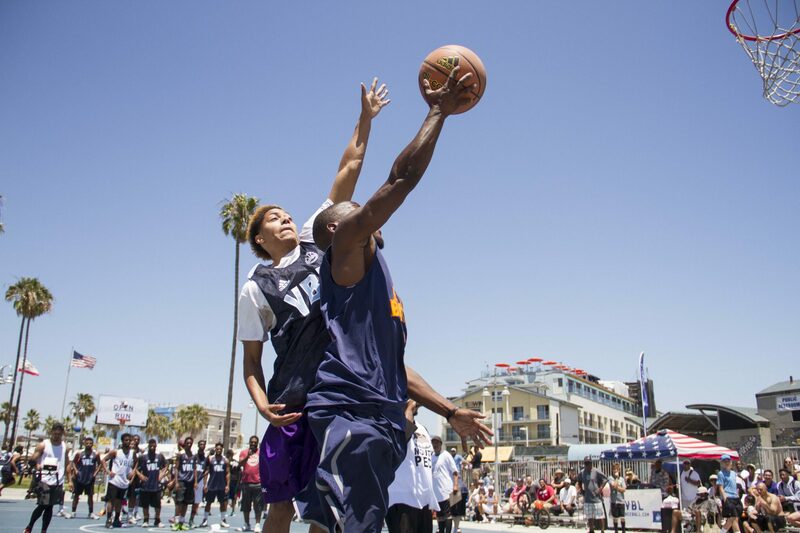 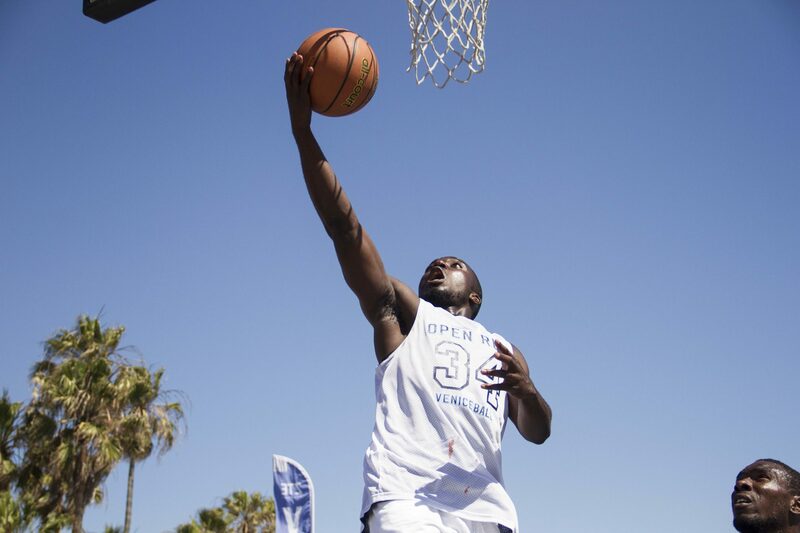 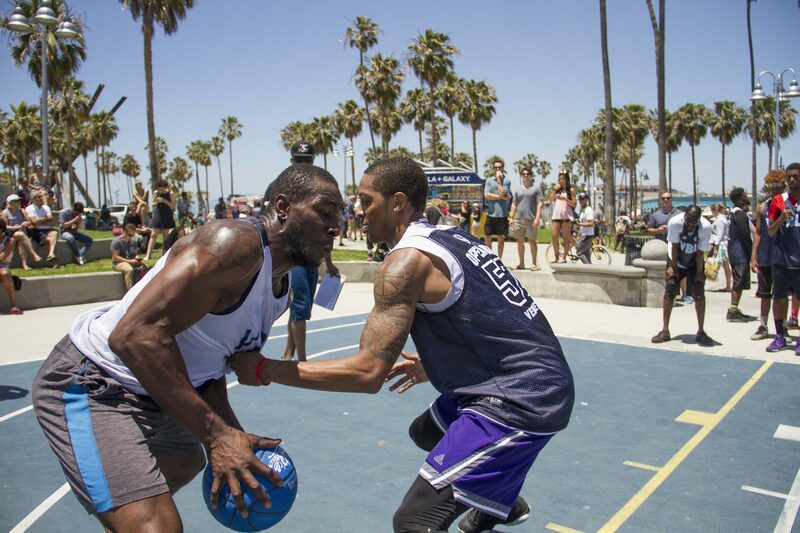 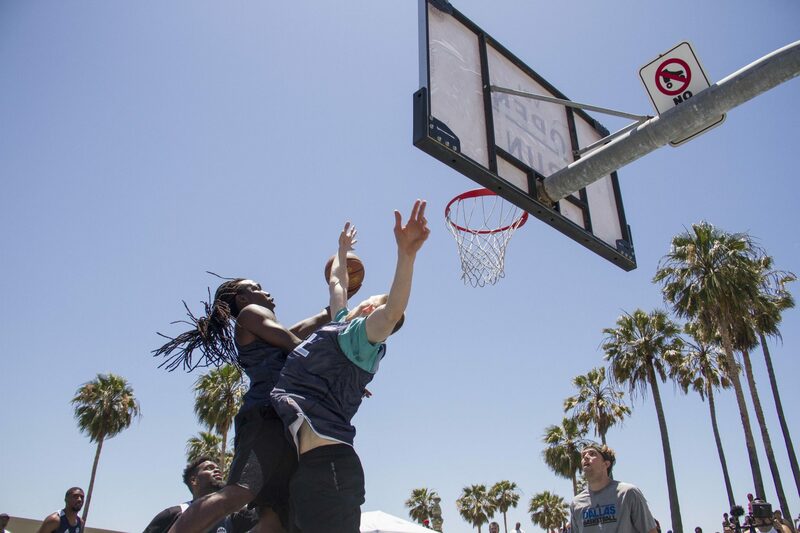 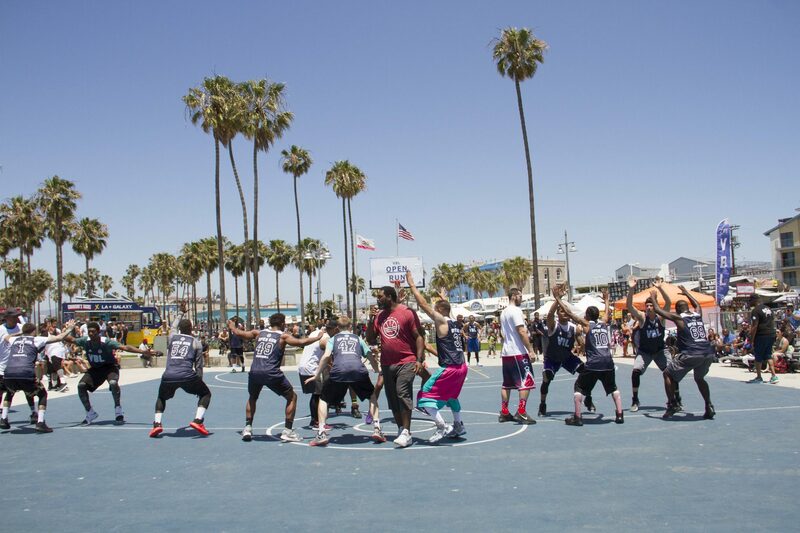 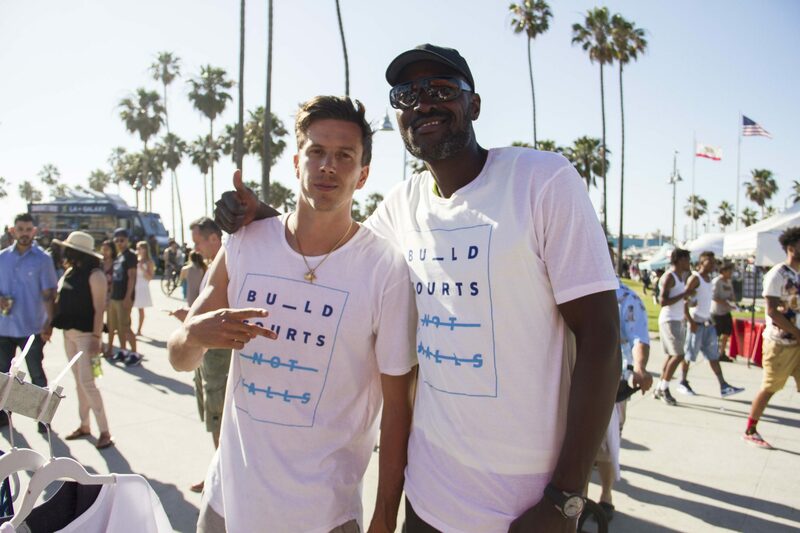 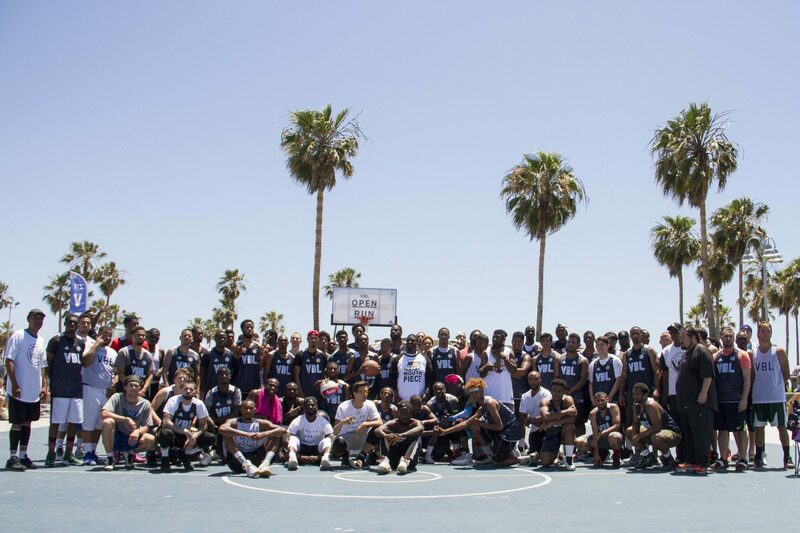 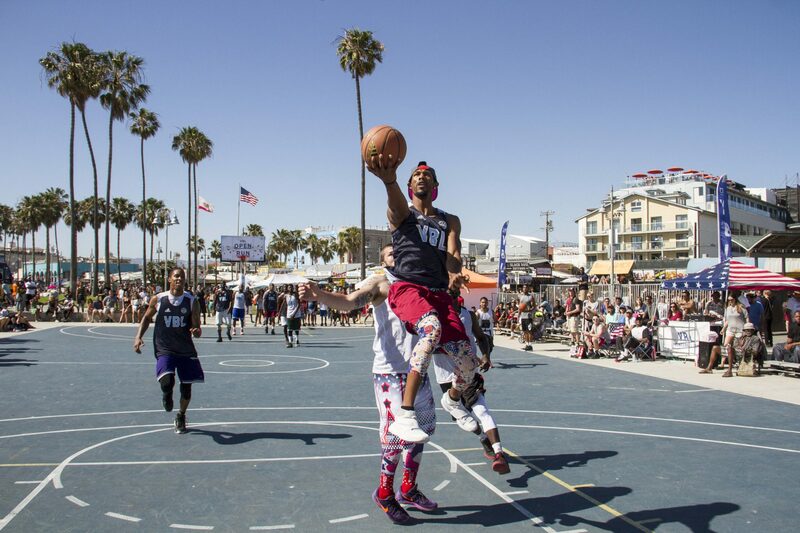 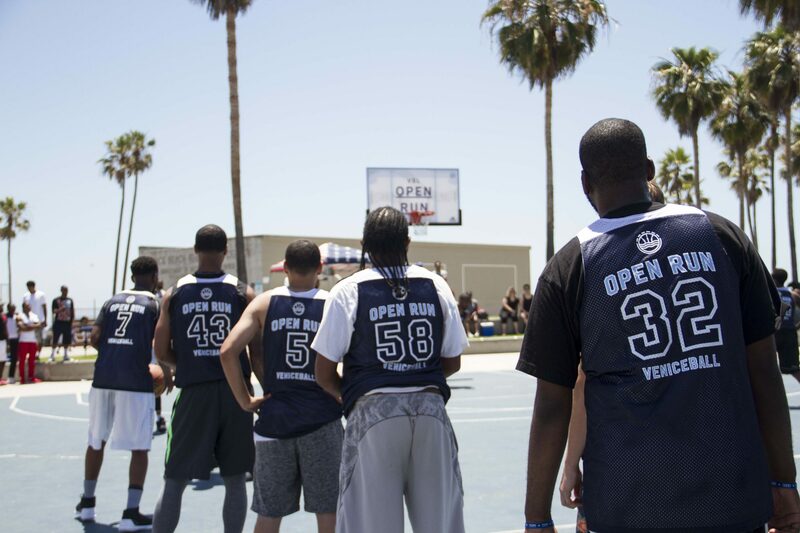 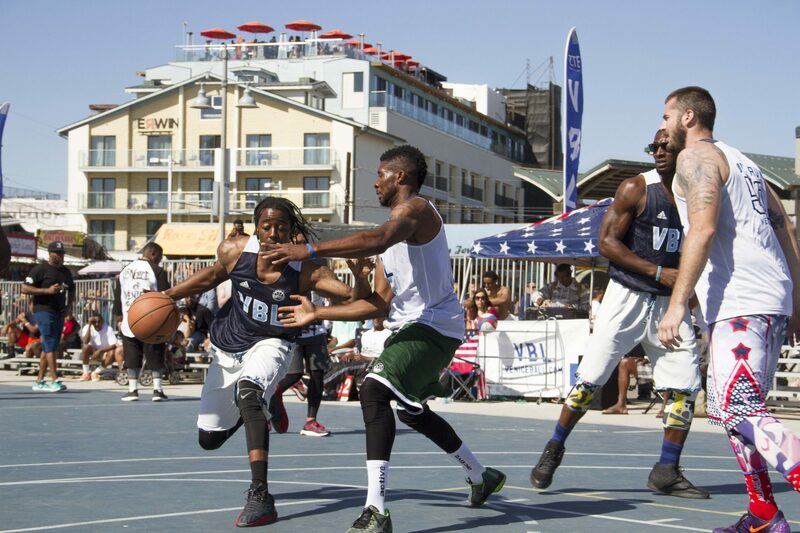 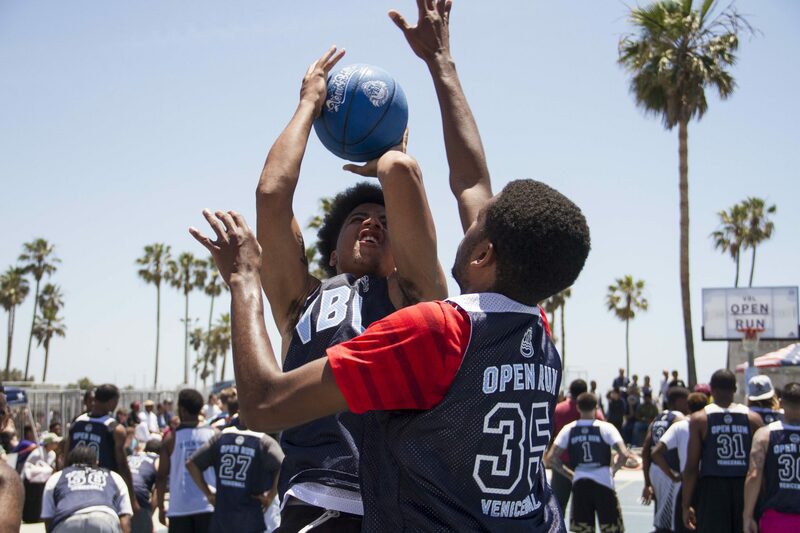 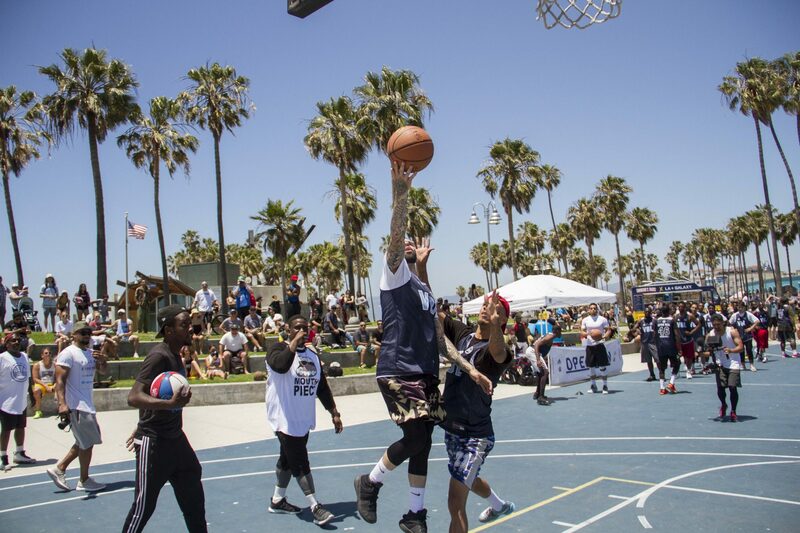 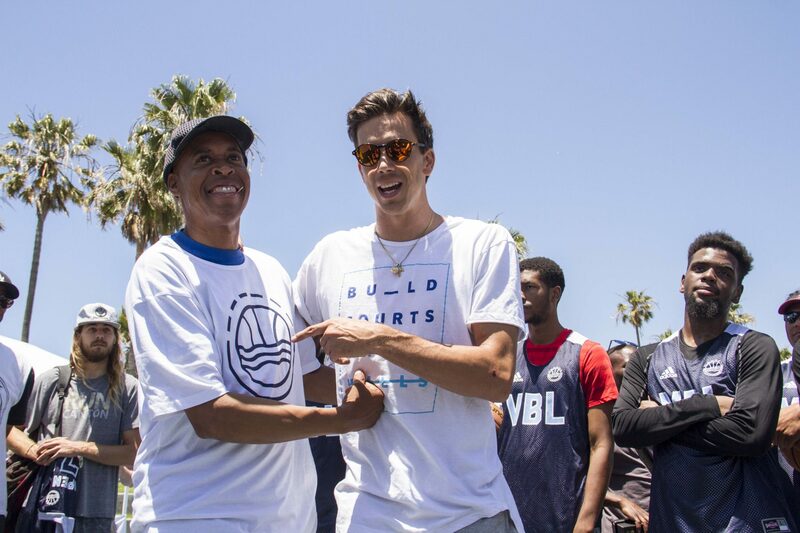 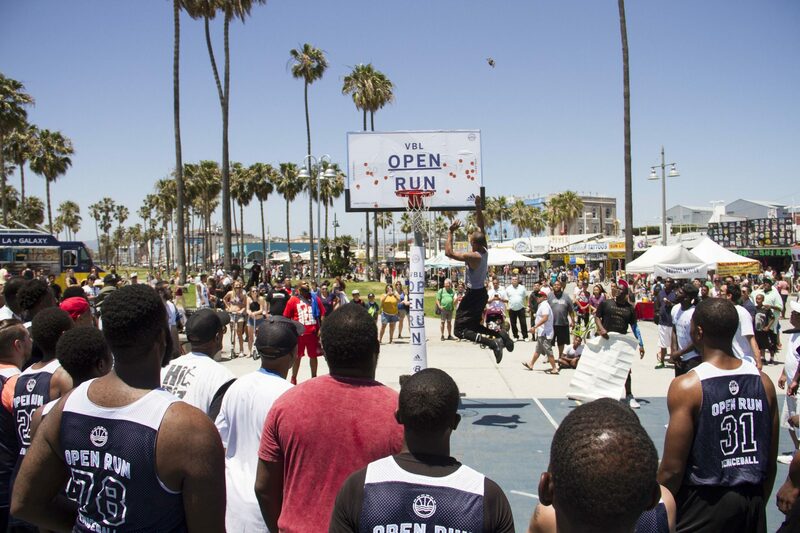 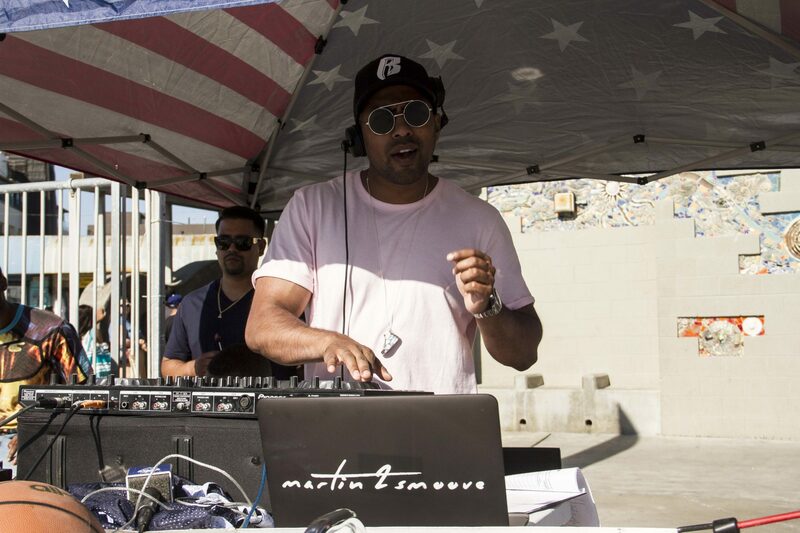 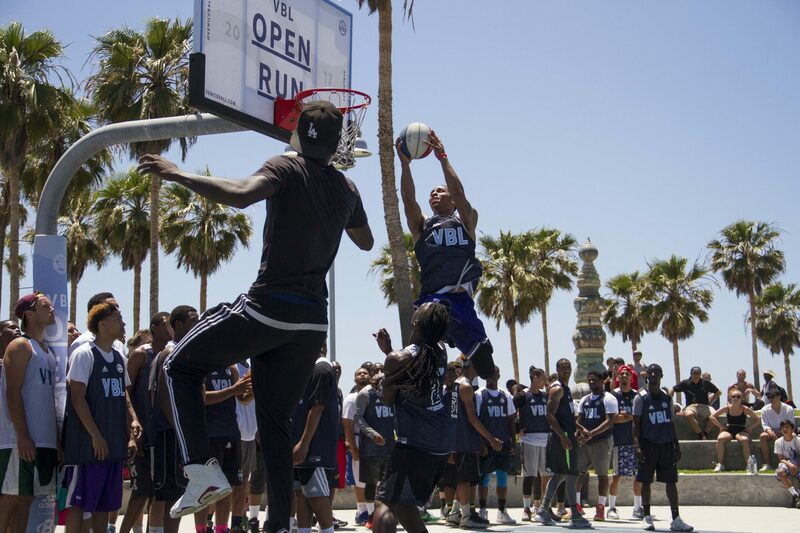 In case you forgot, summer is warming up on Venice Beach and the Venice Basketball League (“VBL”) is feeling the heat! 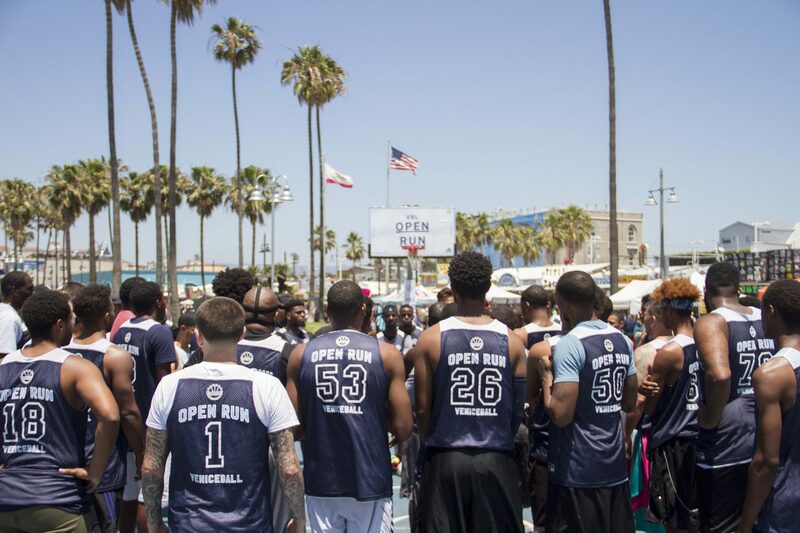 This past Sunday May 21, we hosted our annual Open Run to scout new talent and bring the best young hoopers from around the area into the VBL fold. It was a long day for our 100-strong hopefuls – the most ever for a VBL open run – beginning under the blazing noon sun Keion Kindred led these young men through a VBL combine with endurance, explosiveness, and 1 on 1 drills. 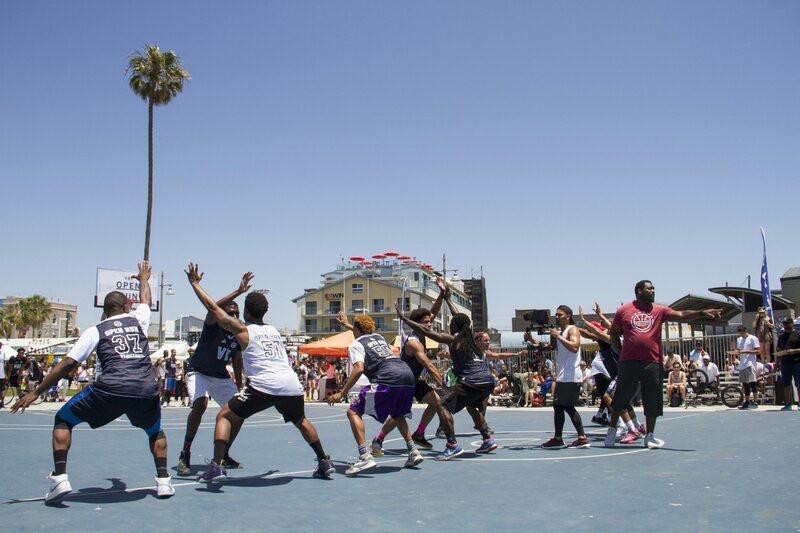 About half the candidates moved on to the next round, a gauntlet of 10 minute pick-up games that pitted the competitors against each other and against some VBL vets in order to see their talents in a live run. 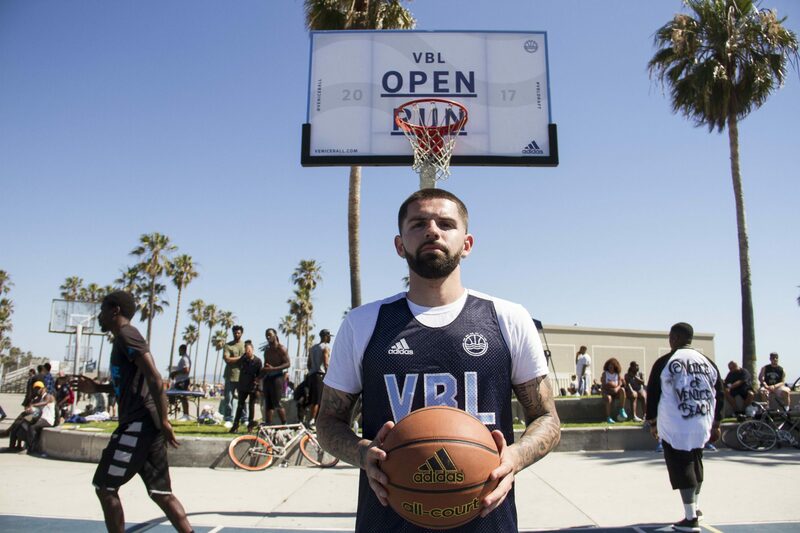 After all, if you can’t make a bucket with Venice’s eminent emcee MouthPiece dogging you, you probably aren’t cut out for VBL hoops! 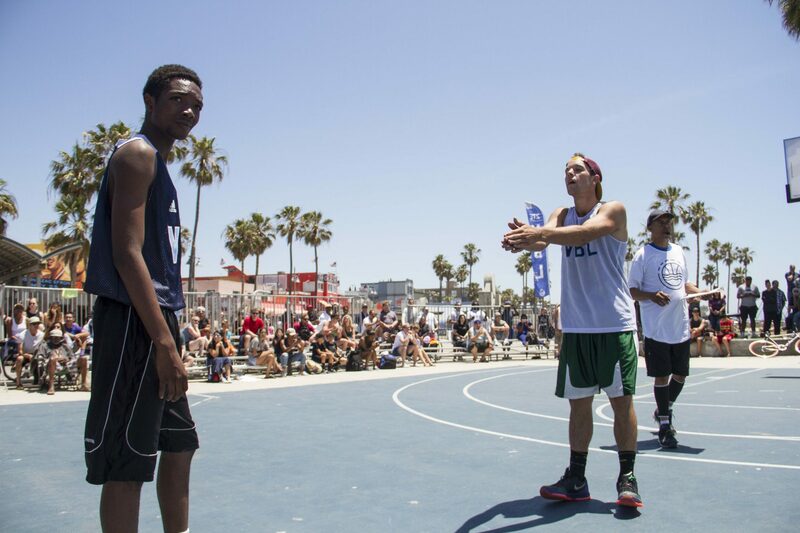 The stakes were high, but some hoopers clearly came to play. 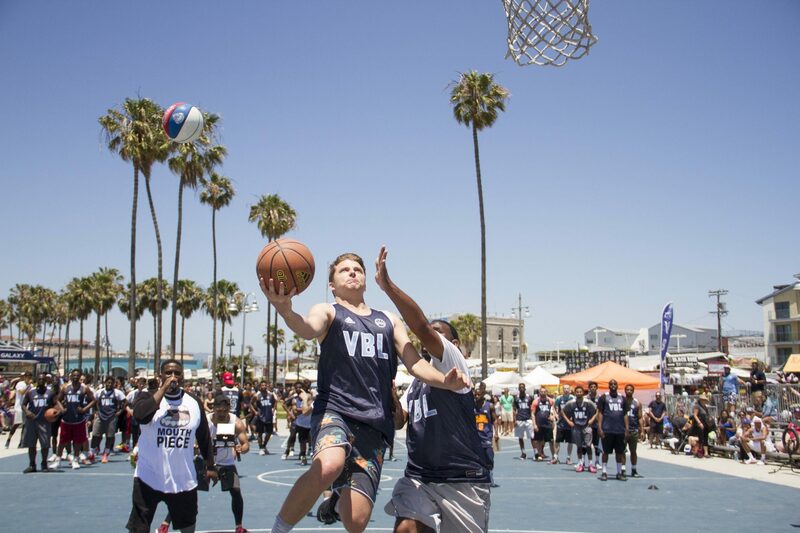 Allen, a 5’8” guard who drove over 2 hours from Riverside to get his chance, dazzled the packed crowd on hand with his heroic handles and moist jumper. 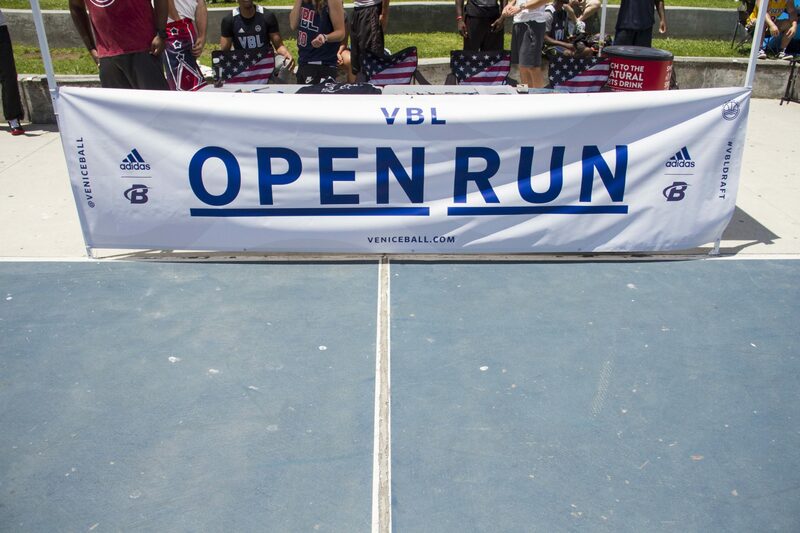 MouthPiece was so impressed, he picked Allen number one overall in the 20-person VBL Draft, which took place immediately following the open runs. 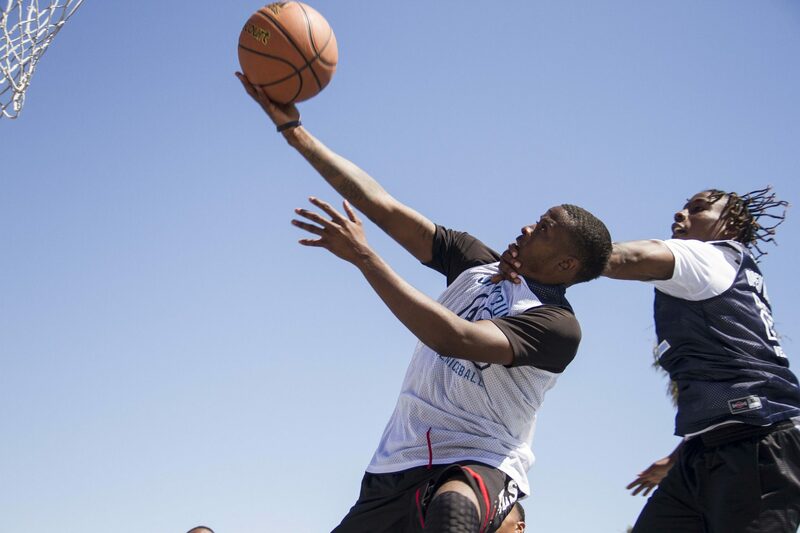 But Allen wasn’t the only notable pick of the draft. 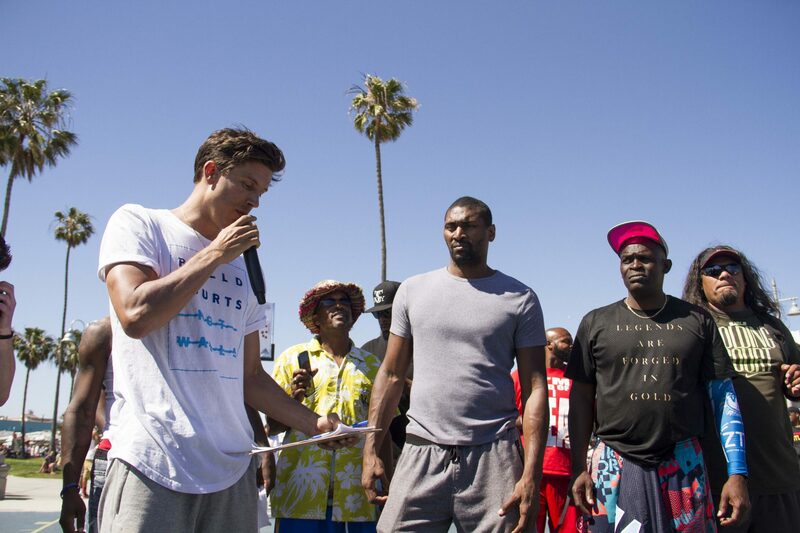 NBA All-Star, Champion, and VBL Coach Metta World Peace sat courtside to scope a fresh young player for his squad. 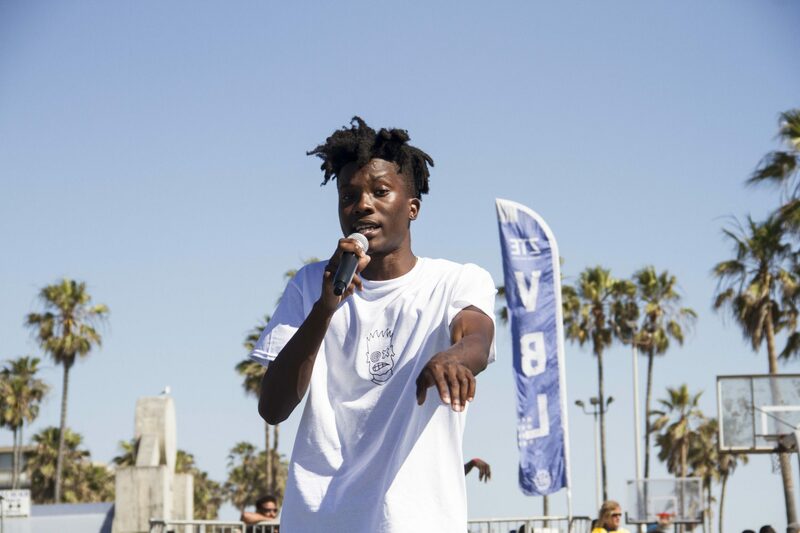 He even took the mic to give the crowd a taste of his play-by-play! 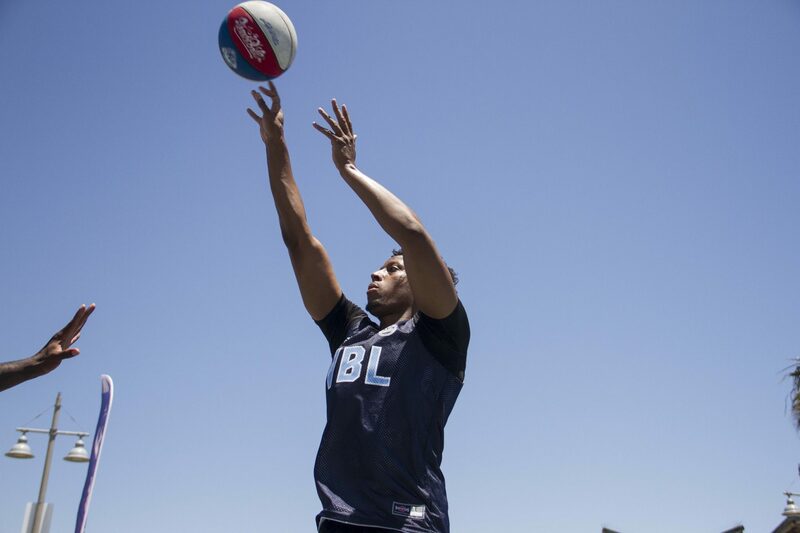 Next stop, TNT? 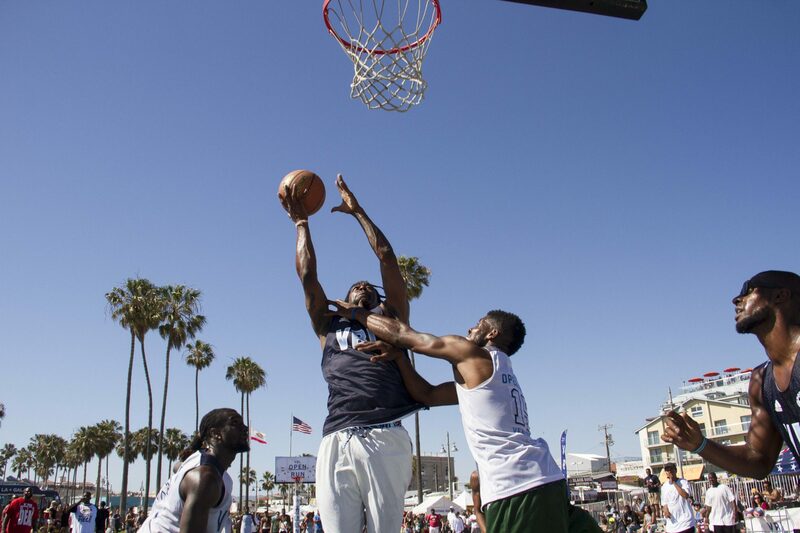 With the 6th pick in the VBL Draft, Metta picked Jamier, a punchy shooting guard with a killer first step. 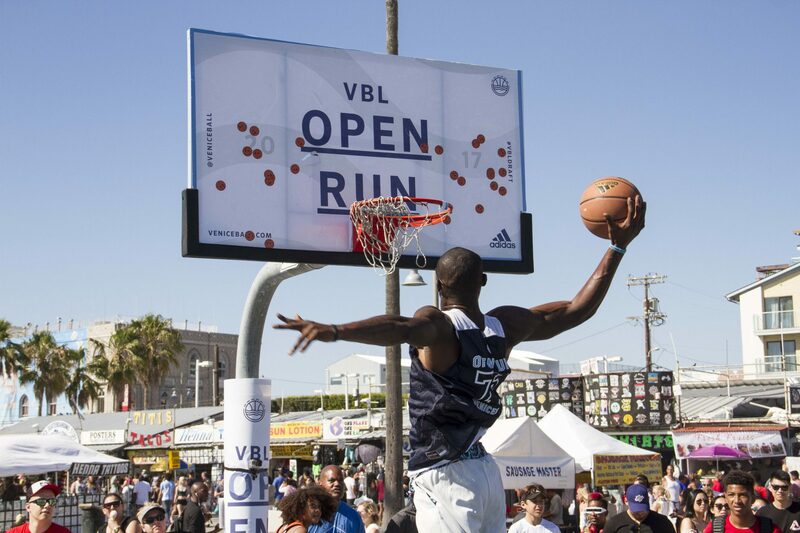 “VBL is big time,” Jamier said in the afterglow of being picked by an NBA legend. 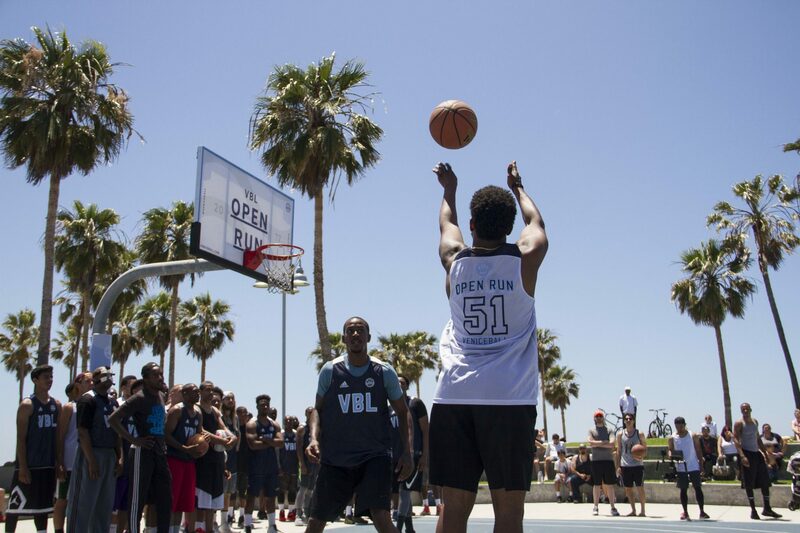 “It’s a blessing, man.” Talk about a drive to succeed: Jamier drove all the way from Arizona for a shot on the VBL stage. 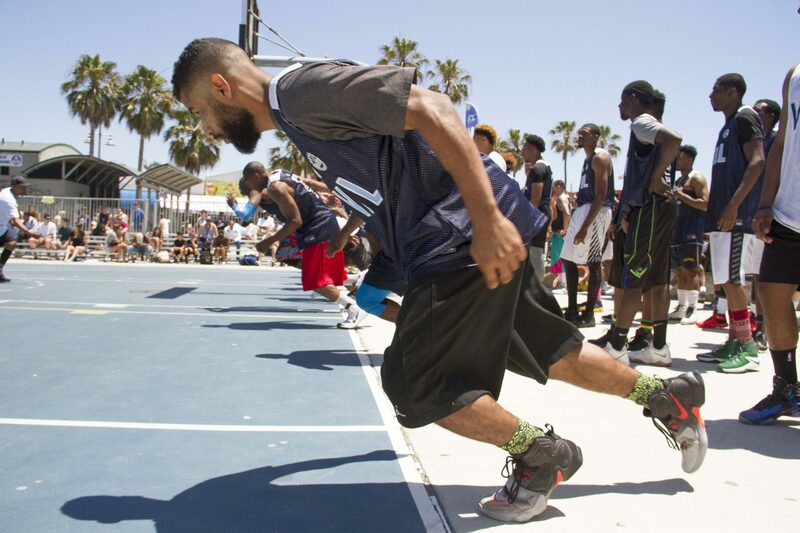 Sounds like he’s got the right attitude! 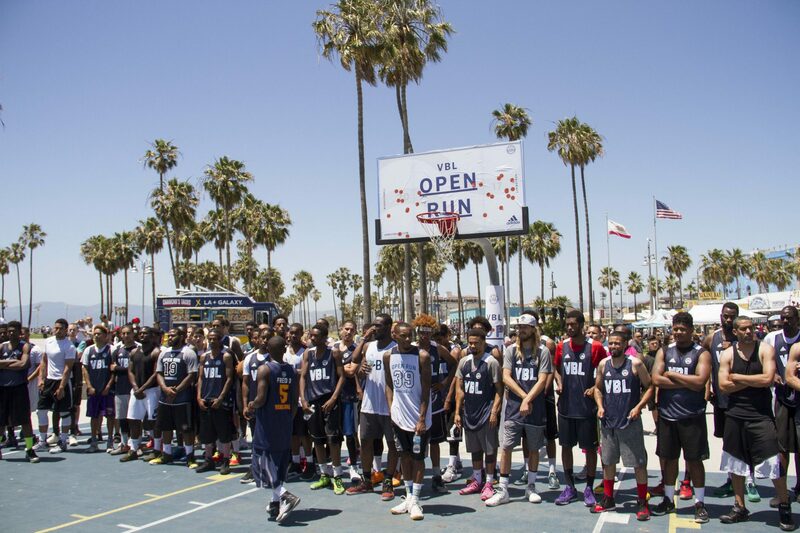 After the draft, the 20 freshly-minted rookies took to the court for their first taste of authentic VBL action. 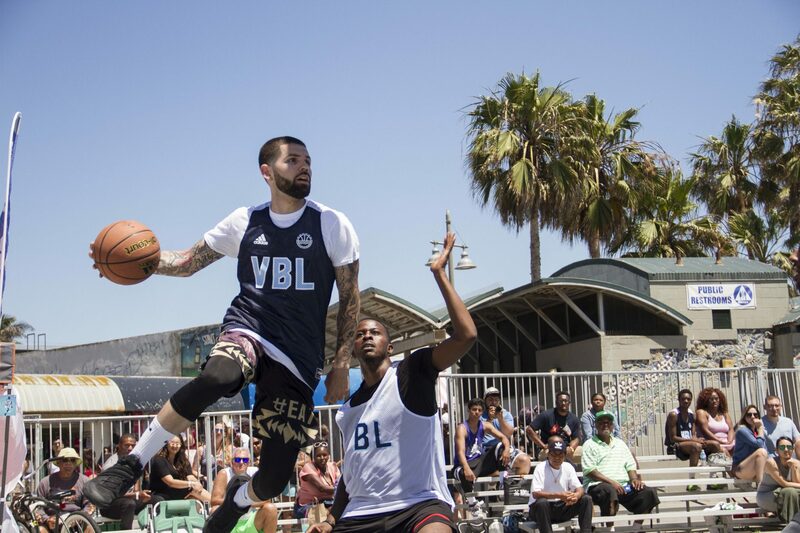 Several seasoned VBL vets – like three-time league MVP T-Will aka King Hustle – mixed it up with the rooks in the Open Run All-Star game. 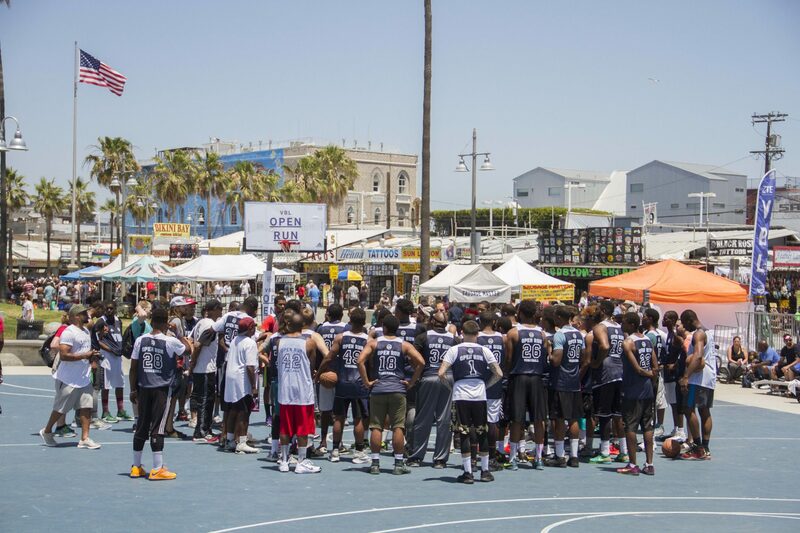 Overall, VBL vets, coaches, and longtime homies were pleased with skills and energy displayed by the 100+ competitors. 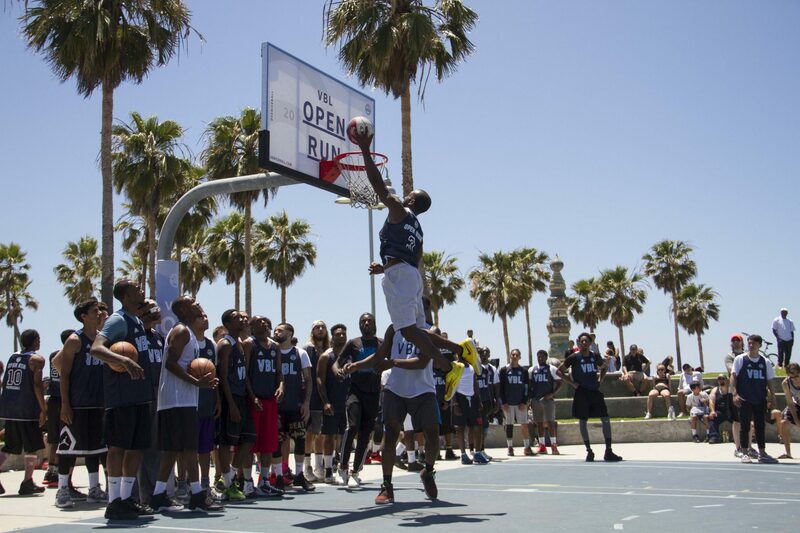 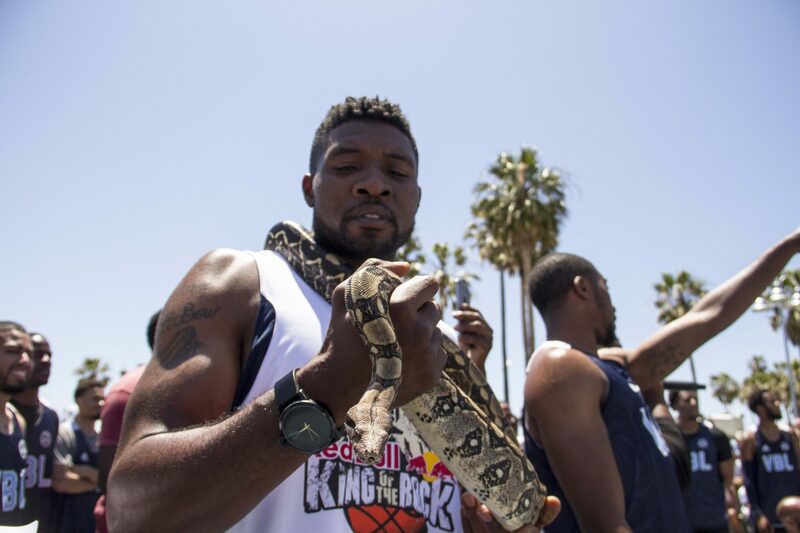 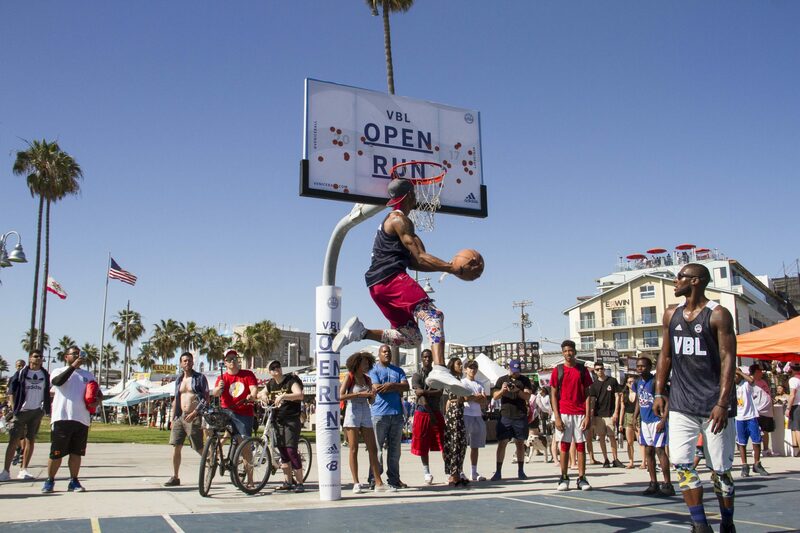 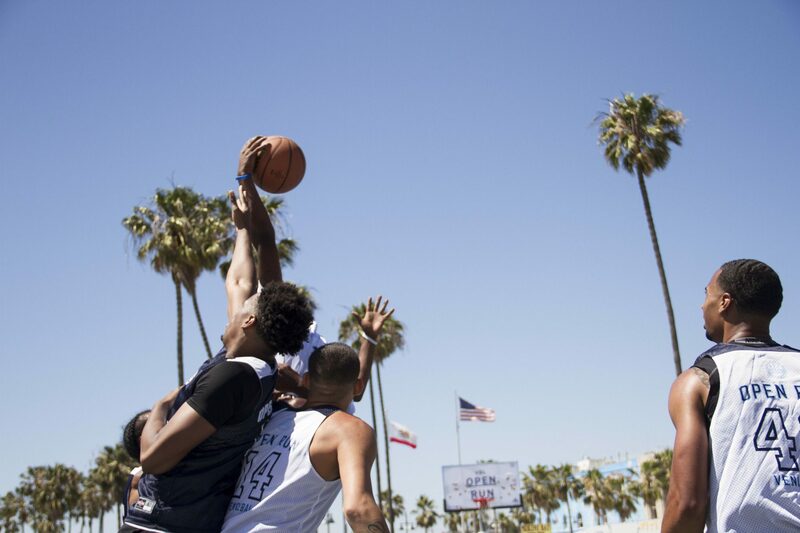 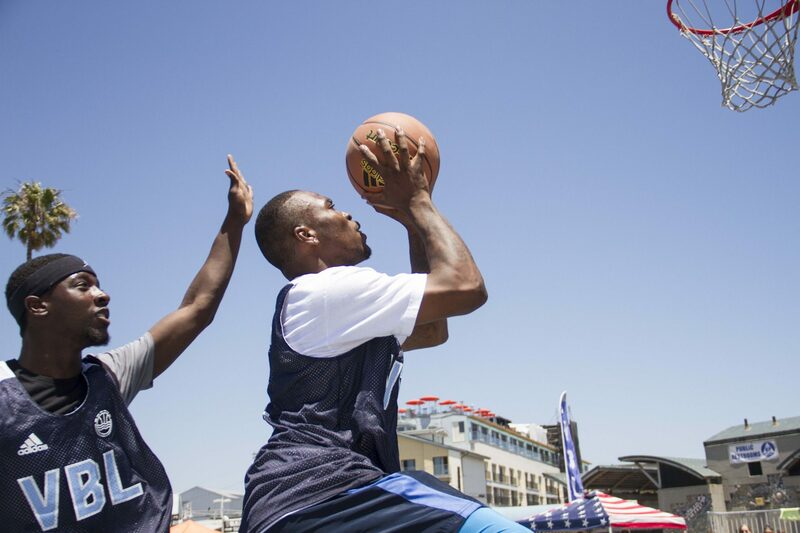 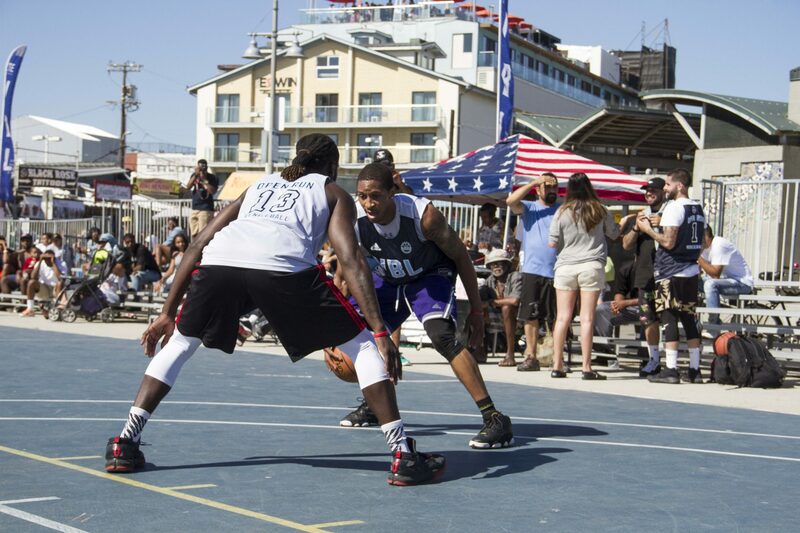 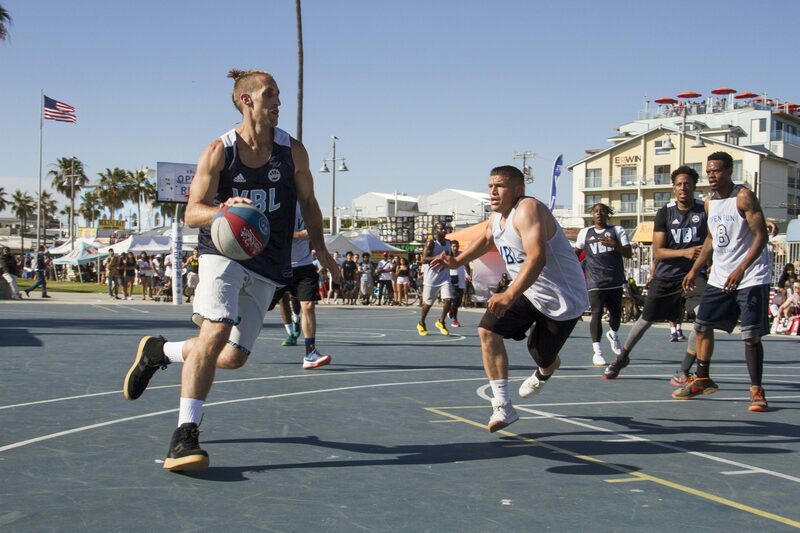 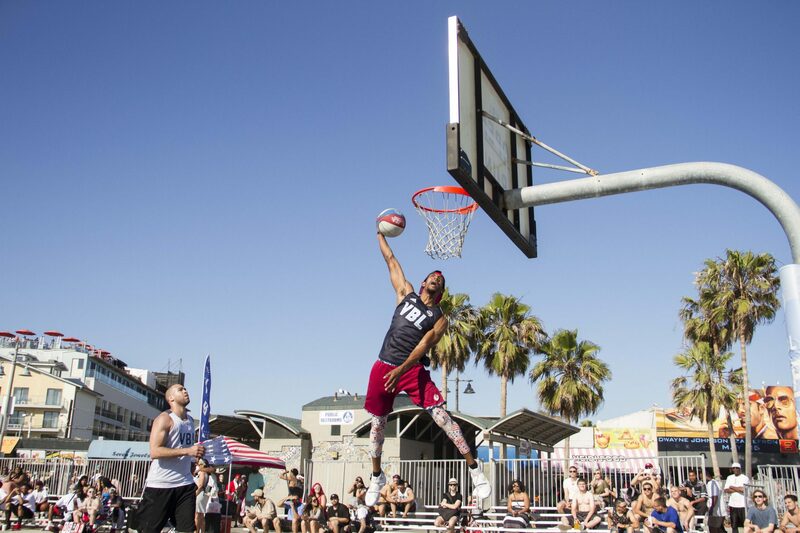 Will the rooks have what it takes to compete on the world’s biggest beach basketball stage? 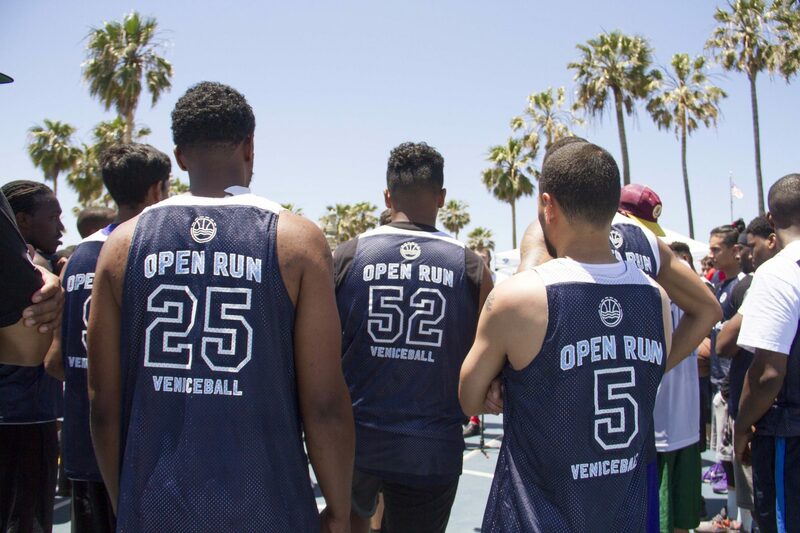 Will they be able to prove themselves on the famed Venice hardcourt? 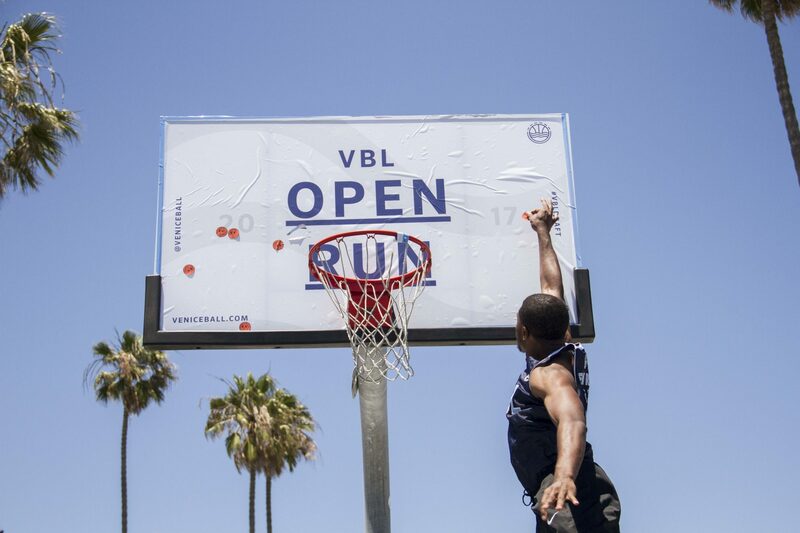 Find out this season – VBL plays every Sunday afternoon throughout the summer beginning this Sunday! 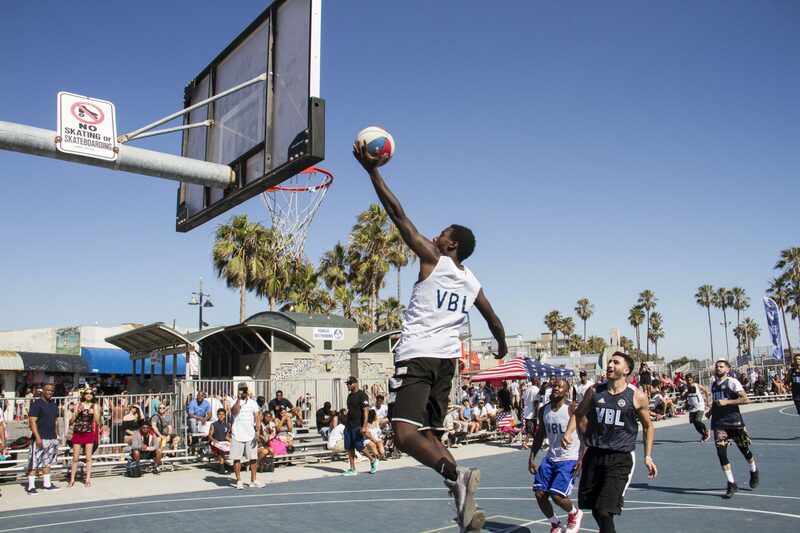 Stay tuned as we spend the week rejuvenating the VBL court in our Build Courts Not Walls project. 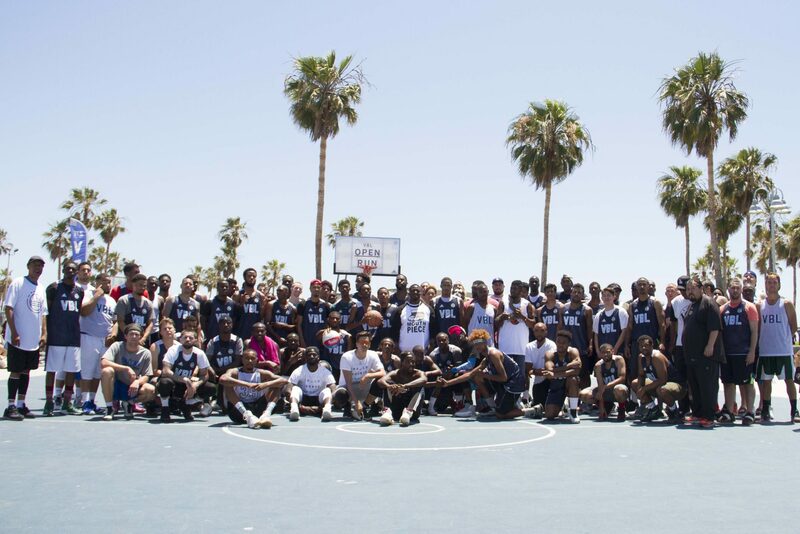 Check our GoFundMe to support this initiative! 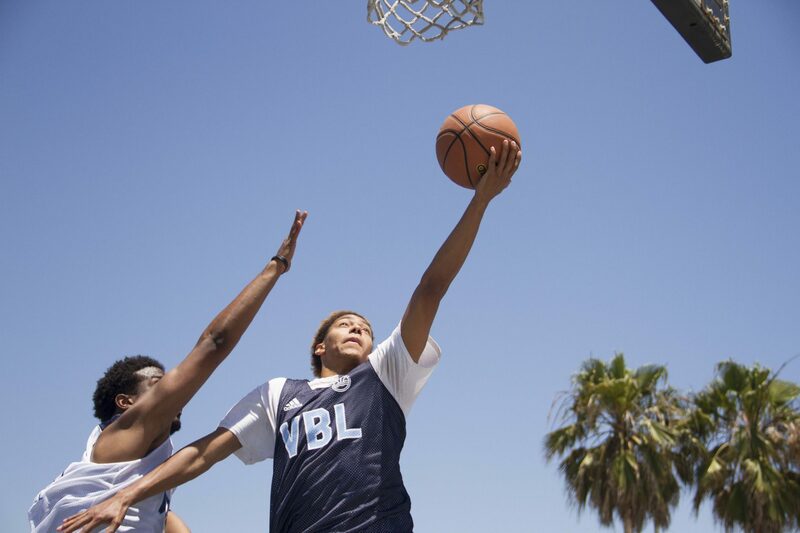 Just in time for the first Kids VBL camp of 2017 starting at 9 AM on Sunday June 4th, followed by the official inauguration of the fresh courts and first VBL games of the season beginning at 1 PM. 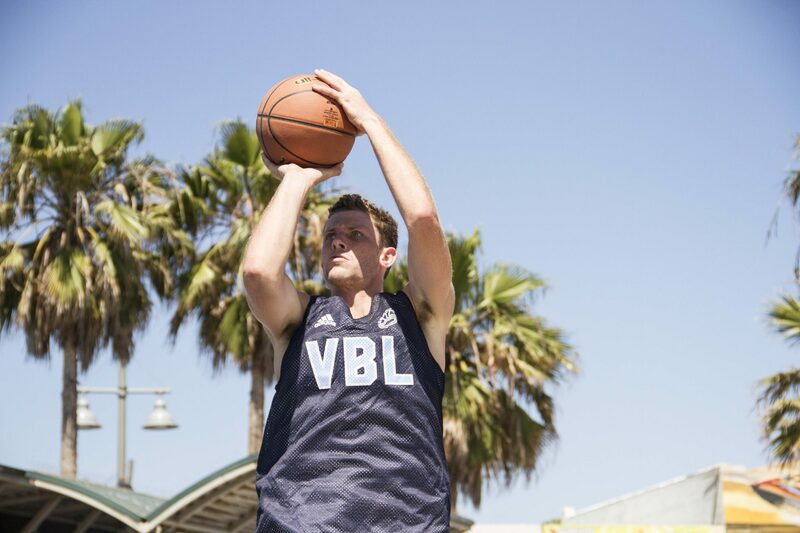 At VBL, the Game Never Stops!